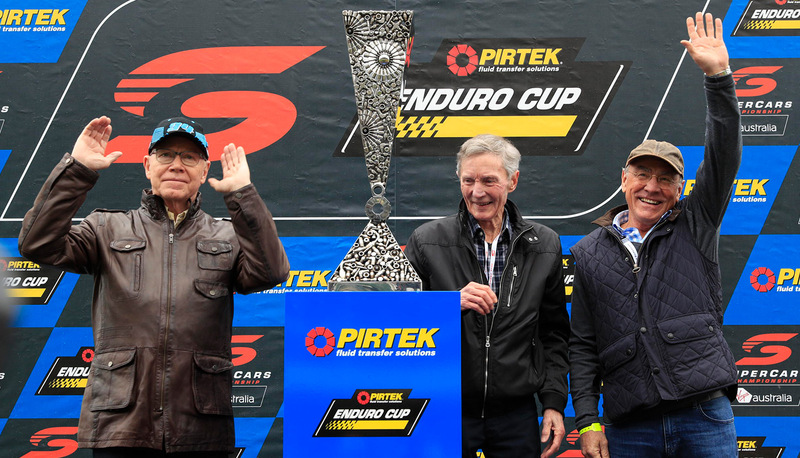 Three of Australia’s greatest ever drivers have helped unveil the Pirtek Enduro Cup at the Wilson Security Sandown 500. Allan Moffat, Larry Perkins and John Harvey were given a warm reception by fans as they posed for the trophy in the mounting yard in front of the grandstand. Moffat’s son James will be driving in today’s race as will Larry’s son Jack. “It’s easy – I’m hoping my son beats his son!” Perkins laughed, pointing at Moffat. “I’m hoping my son beats the rest of them,” Moffat responded. There’s five Sandown wins between them – 10 Bathursts – but both are hoping to see the second generation break through today in changeable conditions. James Moffat, with James Golding, starts fourth on the grid, having earned his best qualifying result in the Volvo yesterday. Jack Perkins, co-driver for James Courtney, starts sixth – both strong positions for the 500km classic. This is just the start. Next month the Virgin Australia Supercars Championship heads to Bathurst – as always, Perkins said, today would be a clear form guide for the biggest race of the year. “There’s no doubt since this all started 30 or 40 years ago, if you’re competitive and could win here you could win at Bathurst and that’s always been the same. Both were joined by John Harvey this morning to unveil the Pirtek Enduro Cup, which will be awarded to the pairing that earns the most points across the four long distances races held at Sandown, Bathurst and the Gold Coast (two races). Garth Tander and Warren Luff (who has won it twice) are the defending champions and start on the front row alongside Jamie Whincup/Paul Dumbrell today.